Gorgeous Georgian apartment in the heart of Edinburgh's City Centre. The apartment is beautifully decorated and is packed full of Scottish fabrics, original Scottish paintings and drawings, warm colours and heaps of personality. It's a great base from which to explore Edinburgh on foot, and once you're worn out from a great day of shopping or sightseeing there's a fab kitchen in the apartment and a wood burning stove for a cosy night in. For the more energetic just dump the shopping bags, get the 'glad rags' on and walk a few hundred yards to some of the best bars and restaurants that Edinburgh has to offer. After a few nights here you're almost guaranteed to feel Scottish and you certainly won't want to leave! You enter the traditional 'shared stair' at pavement level and make your way up the original, stone steps to the apartment door on the 2nd floor (the top). There are two bedrooms; one very large and one large. Both rooms can be set up either as twin beds or double beds (Super King size and King size). The beds are naturally 'Luxury Hotel' standard. The master bedroom has a lovely dressing table with an illuminated magnifying mirror for the ladies. There is a very well equipped large dining kitchen with oven, hob, microwave and everything you need to cook up a feast! It also includes a dishwasher, washing machine and digital radio. The Lounge is beautifully decorated and features a wood burning stove and original fireplace. There is wifi, digital cable TV and a Bluetooth speaker for your entertainment and the side board is crammed full of fun board games for a lively night in! There is also a sofa bed available in the lounge for larger groups. The bathroom is a warm and welcoming room with its large tub, big traditional shower head, stone tiles, warm colours and the all important under floor heating! I've been involved with property in Edinburgh for 12 years and have always loved Georgian and Victorian architecture with all it's grandeur! I have renovated and upgraded many original Edinburgh properties but the 'Snug' is my first Holiday Apartment and I absolutely love it. I live a short walk down the hill from the apartment in an old townhouse in Stockbridge with my wife Rebecca and our 2 little boys. If I ever need a quiet sit down I sneak off to the Snug and hide!! My father in law is a famous Irish poet (Michael Longley) and my sister in law is a well known Scottish/Irish painter and most of the books are Michael's collections and the art on the walls are Sarah Longley originals or sketch work from her bigger collections. Also, if you'd like a kilt made whilst you're here - my brother in law is a kilt maker!! The West End of Edinburgh is a hidden gem of a place, full of boutique shops, delis, coffee shops, proper pubs and restaurants and it just so happens to be less than 5 minutes walk from Princes' Street. It's such a great location that as soon as I saw the apartment I knew it had to be shared! Doing interiors is one of my passions and I was able to cut loose on the William Street Snug with Georgian colour schemes and gorgeous Scottish tartans and tweed textiles and original Georgian walls are ideal for hanging great art! This a gorgeous, quiet Georgian cobbled street in Edinburgh's West End, just 3 minutes walk from Princes Street, right in the centre of town, tram stop 100m away, Edinburgh city on your doorstep. There is on street meter parking immediately outside of the apartment but for longer term parking there is a NCP car park on Castle Terrace or you can park for free in Murrayfield and hop on a tram. A nice selection of Poetry collections and Edinburgh inspired novels and various holiday novels. Golf putting machine, putter and balls to keep your swing in good nick. Great location and a great place to have fun....lots of great things to do near the Snug. Would book there again! An excellent apartment and location- but unfortunately ,a few problems. The apartment is beautifully furnished and tastefully decorated . It is extremely comfortable and feels very cosy and relaxing. The artwork is lovely and the fringe posters add a very nice touch . However we did have a few snagging issues that slightly dampened our over all very positive impression of this lovely apartment. The shower thermostat was not working properly and the water was barely lukewarm - the pressure really was very low so it only dribbled out . We also felt that there needed to be a book with instructions and guidance as to what to do if, for example , as happened on our last night at 4 am - the CO2 alarm went off . We had to hunt for it first - not knowing what it was, and then remove batteries to prevent the whole block from being woken up ! The internet was very intermittent - and kept cutting out which was surprising and frustrating - and the Tivo box was inaccessible - so we weren't sure if we would have been able to record a programme that we missed when we were out . ( Again instructions would be useful. Sorry to sound a bit negative , but when you are paying quite a lot for 4 nights you could do without these problems - the shower especially. Having said all that we really liked the flat and loved the area ( which we already know very well ) and would certainly consider going back if these issues were resolved. What an amazing place to stay! Visiting Scotland is incredible but having someplace as well laid out, tastefully decorated and conveniently located to wonder restaurants, authentic pubs, and everything that you'd like to see while visiting Edinburgh. Snug as a bug in a rug! Absolutely loved William Street snug, fantastic location, close to the city centre, close to the local night life as a local. Can’t wait for our next trip! Beautifully equipped flat just away from the crazy touristy areas, but close enough to join in when you want. The flat is decorated high end, and we were very content in the Haymarket west end. Use Uber and you are anywhere in the city in a few minutes. We liked the welcome package, and when there was a minor issue, the owner’s representative resolved the problem instantly. Stay here,you will be content. Great alternative to a hotel for families. The property was exactly as described. A perfect location to explore the city and be close to the action but one street away from the hustle and bustle. Walking distance to and from the train station and one block away from the tram that goes to the airport. The only suggestion is to provide a couple of fans for the bedrooms when it is warm outside (which I know the weather this past week only occurs rarely). This is a gorgeous Georgian apartment in the heart of Edinburgh's laid back West End, situated less than 5 minutes walk from Princes' Street. The flat is beautifully decorated and is packed full of Scottish fabrics, original Scottish paintings and drawings, warm colours and heaps of personality. 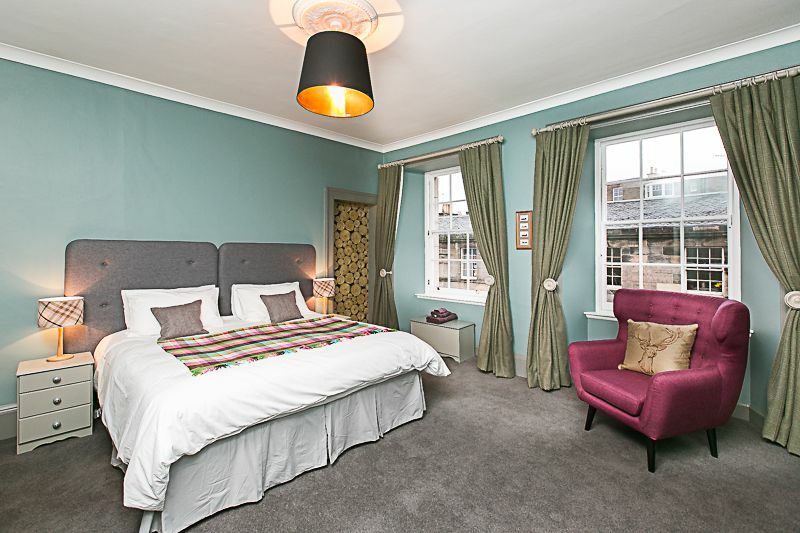 It's a great base from which to explore Edinburgh on foot, and once you're worn out from a great day of shopping or sightseeing there's a fab kitchen in the apartment and a wood burning stove for a cosy night in. For the more energetic just dump the shopping bags, get the 'glad rags' on and walk a few hundred yards to some of the best bars and restaurants that Edinburgh has to offer. After a few nights here you're almost guaranteed to feel Scottish and you certainly won't want to leave! If you require to use the sofa bed during your stay there is a supplement charge of £50.00 payable on arrival.